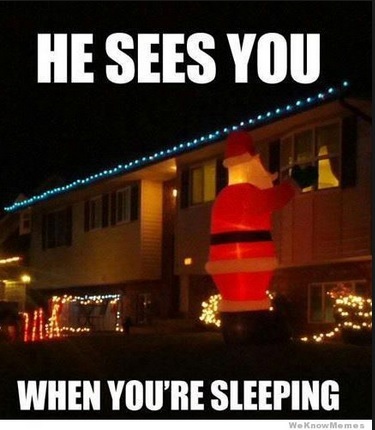 Christmas: The I’m Not Stalking You Way! Part 2 | I'm not stalking you. NOTE: This post has ADULT CONTENT. Not for young eyes. 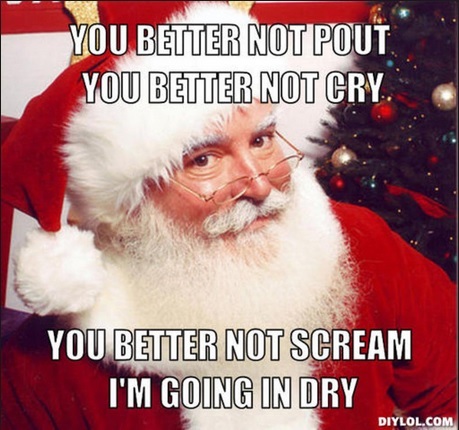 Now that I have that disclaimer out of the way, let’s talk about Santa Claus. One of my earliest childhood memories (I cannot even tell you how old I would have been) was of waking up in the middle of the night in December and hearing the sound of gift wrapping in my kitchen. I sort of groggily thought, “Oh, I guess there is no Santa Claus. I guess my mom just buys all my gifts and wraps them for me.” Then I went back to sleep. I never felt cheated by that experience. I actually think it saved me from waking up to the harsh reality years later that many kids have to go through, when they find out all their gifts come from family members shopping on Black Friday. I have just always known that there is no Santa Claus. Sure, my mom would always sign a few of the gift tags “From: Santa”. My stockings would magically be filled Christmas morning “by Santa”. We had no chimney. She would try to tell me, when I asked, that she would let Santa in the door. I know my mother. There is no way she is opening the door for a strange old man while she is in her nightgown in the middle of the night. She wouldn’t even let people we KNEW in the house while she was in her nightgown. Don’t get me wrong, I love THE IDEA of Santa and his sleigh and reindeer and elves. I love the songs. I love the Classic Coca-Cola ads with his image. I just don’t fully buy into it. I blame the realistic Capricorn in me that always seeks the truth. 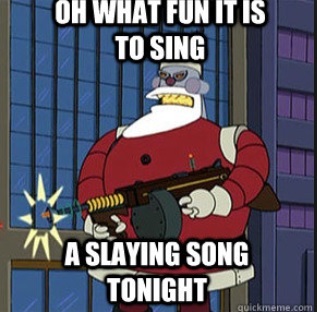 But, the little that I DO believe about the legend of Santa comes from an unlikely source. PM Magazine was a syndicated news show back in the early 1980’s, which featured human interest stories and lots of entertainment content. In my area, it was shown on WTOL Channel 11, just before The Muppet Show. So, I would often see the last five minutes as I was waiting for The Muppets to come on. In my memory, the picture is a little greenish. I think that was because of the color TV we had that was dying and only had one color left–green. Anyway, I remember a story near Christmas time on PM Magazine about the REAL Santa Claus. * I recall the story being about some old guy who lived in a town near the North Pole. For his town, he would dress up as Santa and deliver toys to all the kids in town. To know that there was one guy who played the part of Santa in one town in the whole world was enough for me. To know that something like that exists has kept me going with the Christmas spirit all these years. Of course, that was 30 years ago. Dude is probably dead by now. And there was probably one mom like mine in that town who wouldn’t want to let him in the door anyway. But maybe, just maybe, he is still delivering those presents, to this day. I do not plan to encourage or discourage my son’s belief in Santa Claus. But if he asks me if their is a real Santa, I will recite my fuzzy memories of that green news story to him from three decades ago. 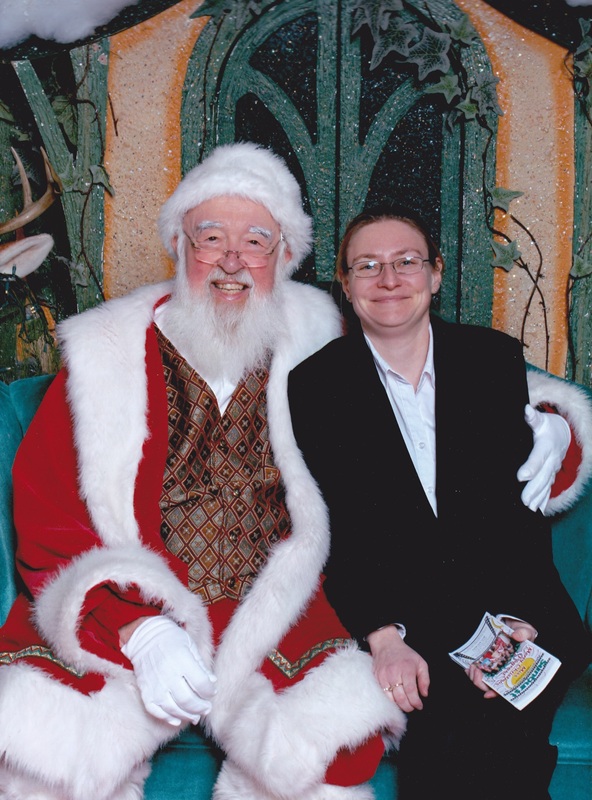 Working at the mall recently, I got to know the Santa there very well. He is a super-nice guy. Even though I found out what his secret identity is the rest of the year, he still seems like Santa to me, because he is the only one I have gotten to know personally. * I am sure many of my details about the PM Magazine story are inaccurate. I found where it may have aired on 12/24/1984, with the title of Real Life Santa. I would have been only like 8 years old. But that show aired so long ago, that anyone else’s memory would be tainted with time as well. 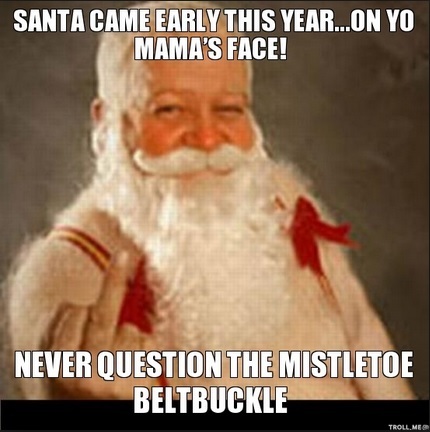 Unless someone has the actual classic footage for the Santa story, in which case I would LOVE to see it. Posted in Childhood Reminiscing, Entertainment Worship & Review and tagged adult, believe, child, Christmas, dirty, gifts, meme, naughty, PM Magazine, Santa Claus, The Muppets, WTOL. Bookmark the permalink. Pingback: Christmas: The I’m Not Stalking You Way! Part 1 | I'm not stalking you.